Laila decided to take a long nap today (after not sleeping that great last night of course) and I had a bit of time to go play along with the challenge at Fab Friday. I love the sketch and am glad I had time to play. I don't know what's up with my horrible picture taking lately, but I'll try to work on that. I think I moved my light tent the wrong way and it is not working out. I really like how this one turned out. 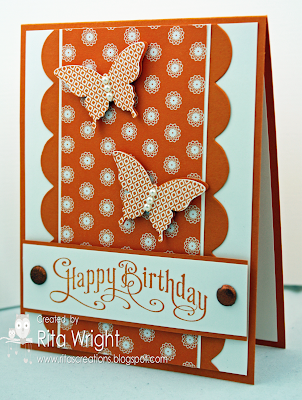 I love the mix of patterns, the bit of bling, and the ORANGE. Finally a bit of my retired DSP got used too. I am running out of room, so I am trying to make myself use up some of it and NOT allowing myself to buy any more until I clear out some. I'm keeping this short as my Pinterest recipe dinner wasn't so good and I'm still hungry. I'm going to have more cranberry salsa (which IS good) instead. 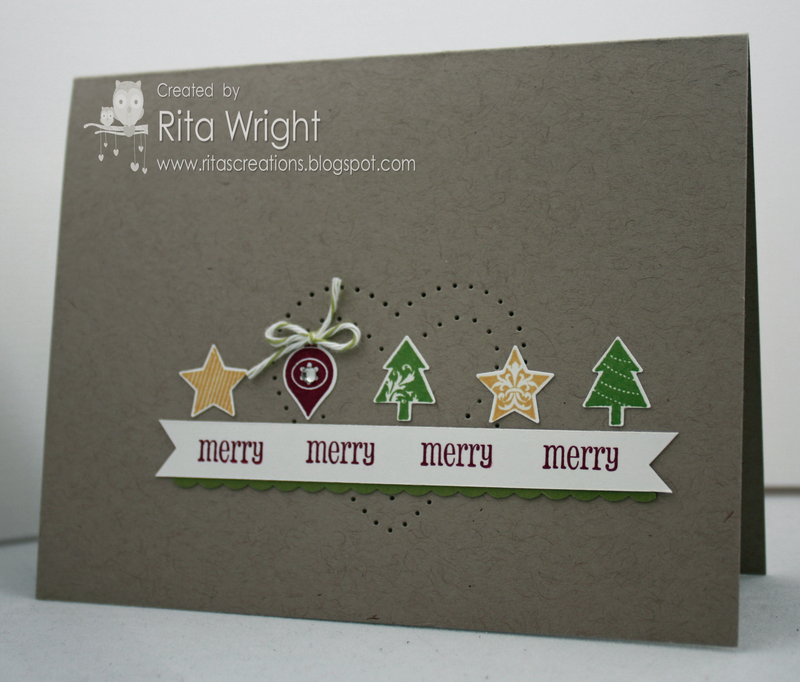 I missed the chance to play along with this fun sketch at Try Stampin' On Tuesday, but I pinned it for a later date and that just happened to be yesterday. :) I am trying to work on some teacher thank you cards and birthday cards for kids so I'm relying on my pinned sketches for inspiration. 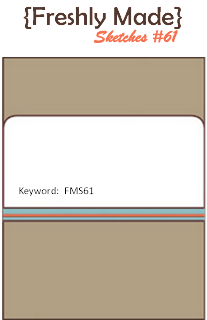 My card isn't exactly the sketch, but it's close. 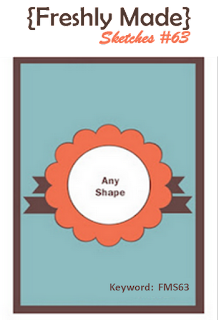 Hopefully there's a sweet teacher out there who will one day love this card. I thought the colors were so pretty together. 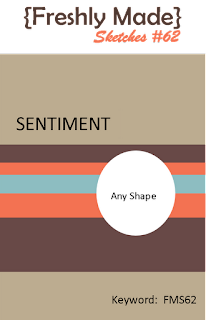 It's a combination from the Color Coach and I love it, but struggle sometimes to make it work. It came together so easily on this one! It really just depends on the stamps and type of card you are making with those color combos. Sometimes it works out and sometimes not. Yesterday we had our picture with Santa day. 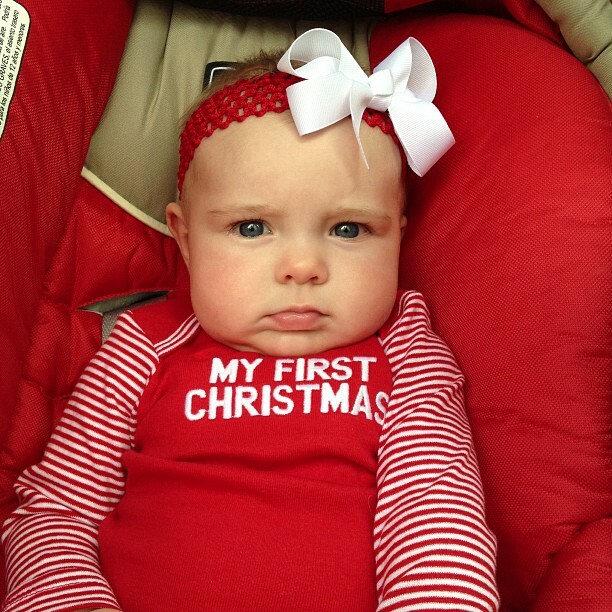 She's not looking too happy here, but I think the photographer captured some good shots. I'll post the one we decide on once we get the proofs and pick one. I didn't realize how bit that bow was until we got there. I thought she needed one since the jammies were not super girly, but dang it's big! 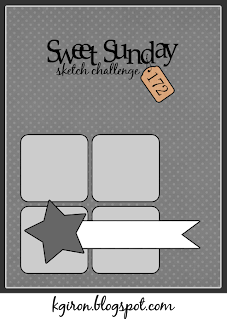 Isn't this week's Sweet Sunday Sketch AWESOME?! I love it and will be using it a lot in the future! 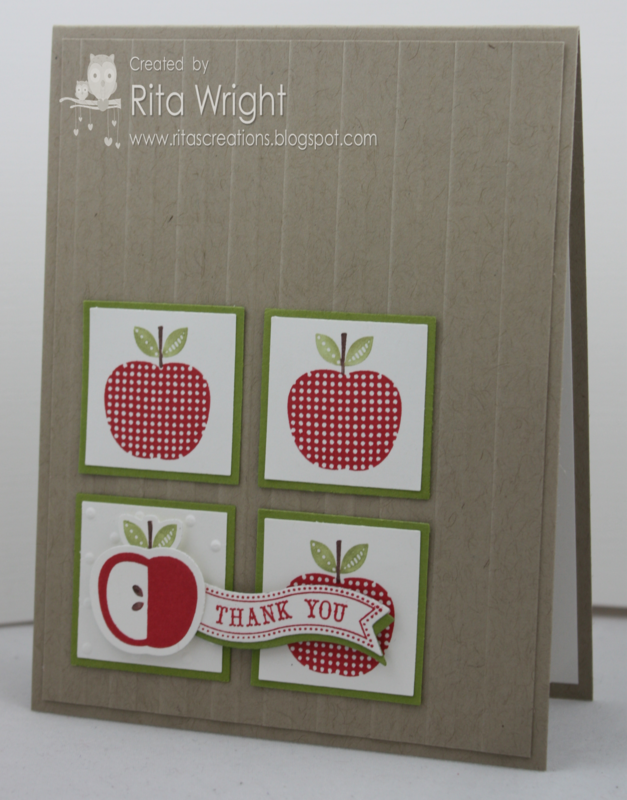 I needed some teacher thank you cards and this worked perfectly for some really cute ones! I hope everyone has enjoyed a wonderful Thanksgiving Day. We have so much to be thankful for this year, so our day was great. Our food all turned out delicious and we spent some time with family before cleaning up and putting up the tree! 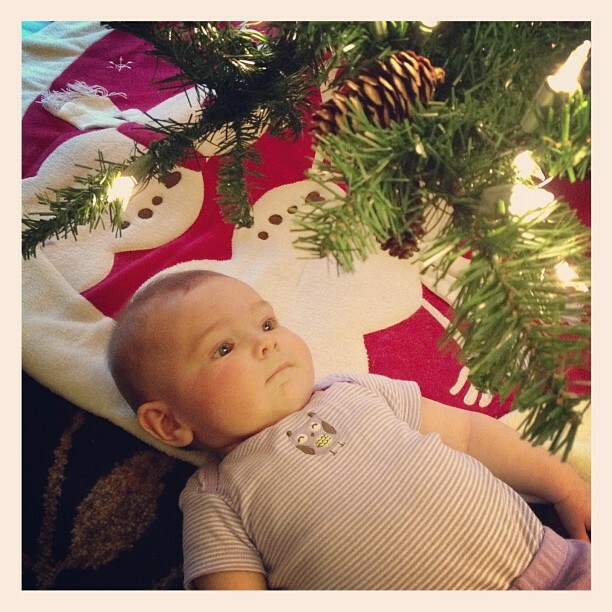 Laila loved the tree. I hope she enjoys the smaller one in her room just as much. :) Now I just need to get serious about shopping. My girl isn't so little now. 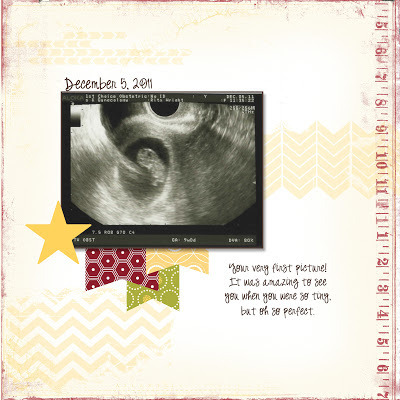 I can't believe all the changes that happen almost overnight! Saturday night I decided to try putting her to sleep without swaddling and wow! She slept great and has every night since. Not only that, but she's been going to sleep on her own! I bought a butterfly that projects stars on the wall and plays music and we turn it on and she watches it (and sings along) until she falls asleep. It's amazing! 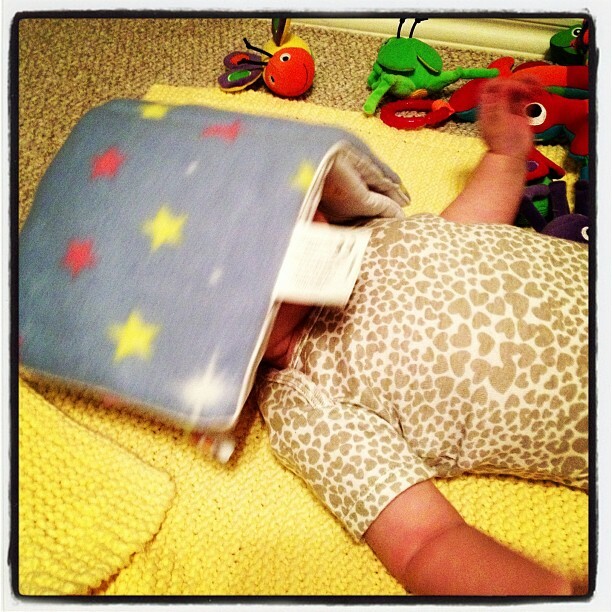 She's starting to roll over on to her side while laying on her back, so I think she'll get all the way over soon. Not sure how that will go since she hates being on her tummy! She has rolled from tummy to back, but doesn't do it consistently just yet. My mom isn't going to know what to think when she arrives in a month. She hasn't seen her since she was a few weeks old. 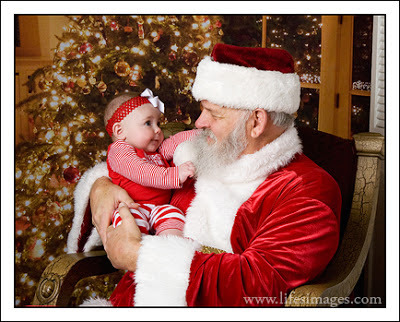 It is going to be an amazing Christmas for sure. 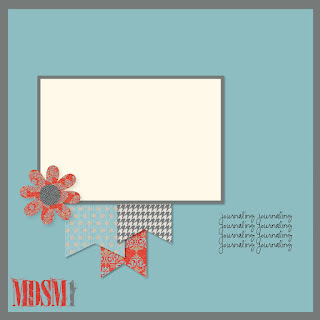 I love playing with the vintage overlays and I just got the chevron download so I had to use that one too! :) Now I'm off to bed so that I'm not grumpy when my girl wakes up later tonight. Remember that My Digital Studio and the MDS Upgrade are both 50% off this week! Get it while it's such a great deal. I promise you'll love it! Make a project with "Leaves". Or Make a project saying "Thank You". 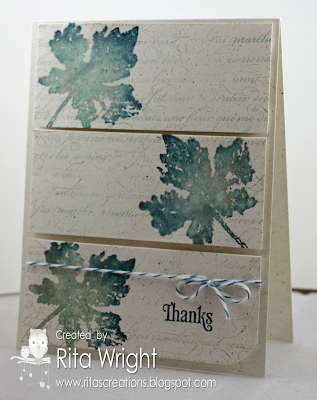 Or "Mash it Up" and create a "Thank You project with Leaves". 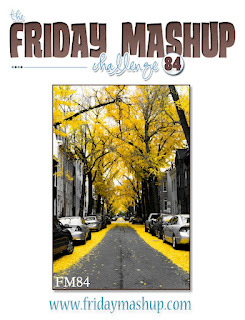 I'm the hostess this week at The Friday Mashup! I'm sad to say that this is my last week as part of the team. Life is just getting too busy and I can't keep up with everything I have on my plate. I have so little stamping time these days and I need to devote it to my business as much as I can. I've had such a wonderful time with this group of ladies and I'll definitely try to play along with some of the challenges if I get a chance. So on to the card, right?! This is a NON-clean version of this week's sketch at Freshly Made Sketches. 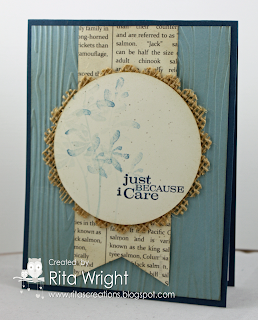 :) I loved it so much that I wanted to make another card but add in some sponging and distressing. I have had a few questions for my club cards from last month, so I wanted to do a similar card and answer a few questions. 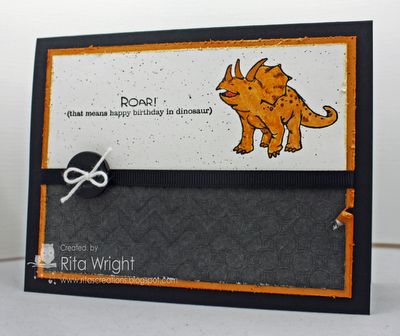 The background is the new Core'dinations cardstock that has been embossed and sanded. Easy! The leaves use the oldest stamping technique that we've all been doing for years, rock n'roll! I just LOVE French Foliage as it works so great with that technique! My little purple girl. We needed a break from all the pink today! Pink, glitter, bling. All there. 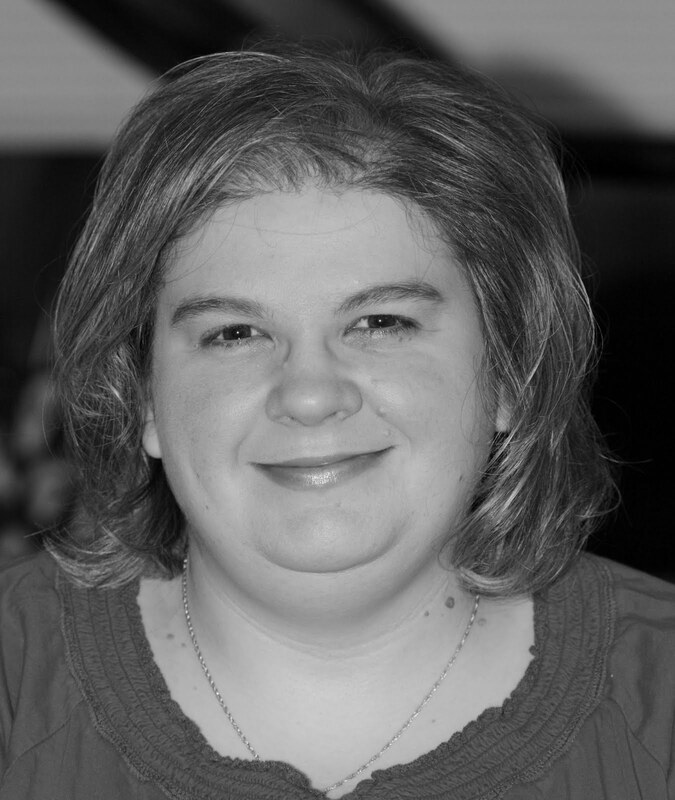 Happy Birthday Anne Marie!!!!!!! Sorry guys! I'm still here! Just a busy weekend that ended up with a not so lovely stomach virus or food poisoning. Not sure which, but either way it was NOT fun! I am all better now, but that meant today was full of errands and then a rush to make my card for Freshly Made Sketches! Yikes! I finished, so I think I'm still on the team. lol Anyway, I finally took a better picture of our club card and wanted to post it. It was quite a hit and I think almost everyone bought the super awesome Natural Composition DSP. Do you have it yet? If not, GET IT! 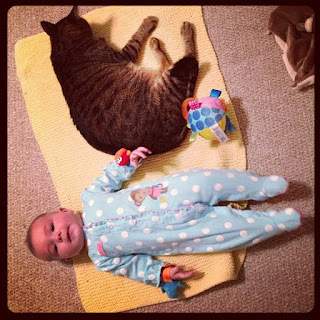 Lately there has been a war of sorts between baby and cat. They either want to lay on her blanket OR they want to play with her toys. Bandit is particularly fond of this soft blanket, so if we forget and leave it spread out, we'll find him all stretched out on it. 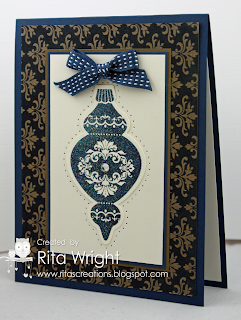 Make a project with "Dry Embossing". Or Make a project using the colors " Daffodil Delight, Basic Grey & Basic Black". 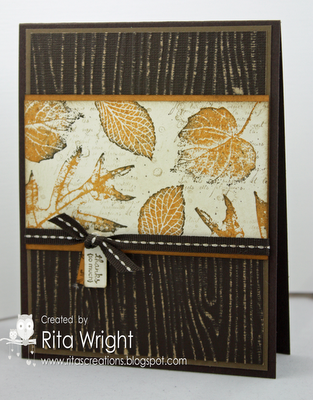 Or "Mash it Up" and create a project with "Dry Embossing & The Color Combo". 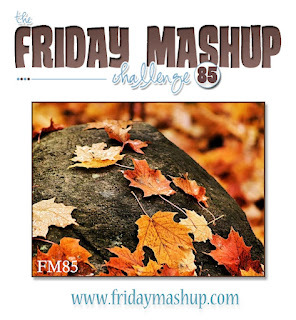 Isn't this a great challenge from the Friday Mashup? I think that picture is just gorgeous! These are some of my absolute favorite colors together so I was happy when I finally found time to get a card made. 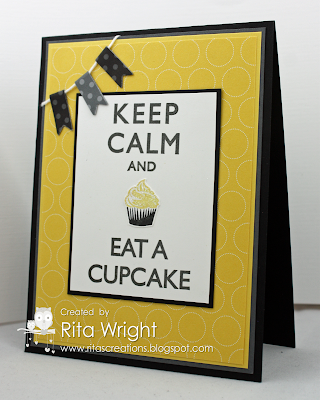 This week has been SO busy and I still have stamp club tomorrow night! Thank heavens for coffee! I love how happy she is most of the time! Whew! I hope everyone survived the election. I know some of you in the swing states have to be super happy that it's over! Now you can answer your phones again. 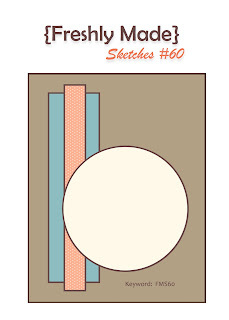 :) It's Wednesday and that means it is time for a new sketch from Freshly Made Sketches. 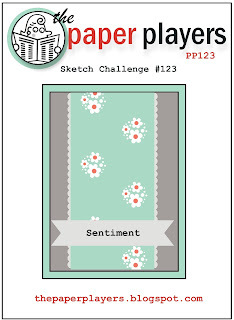 Tui is our hostess and designer this week; isn't her sketch great?! 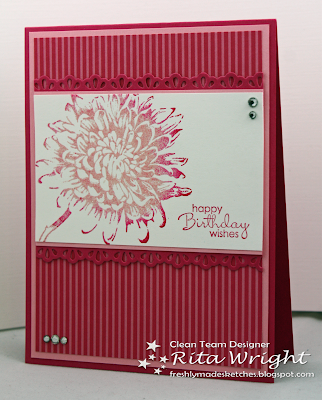 I was limited on time to put my card together this week and was so thankful for such a versatile sketch that was easy to work with. Today has been a weird day for Laila. She's either been napping or crying. Thankfully we got the replacement part for her swing yesterday so she was able to relax and take a LONG nap in it today. I hope the aftermath of the shots goes away soon so that we can have our sweetie back. After that we need to work on adjusting for this time change because mommy and daddy are getting tired. One of my friends gave me the idea to take a yearly Halloween picture with a pumpkin, so here it is! :) We had a lot of work to get her to actually look up! Pumpkins are super interesting you know! 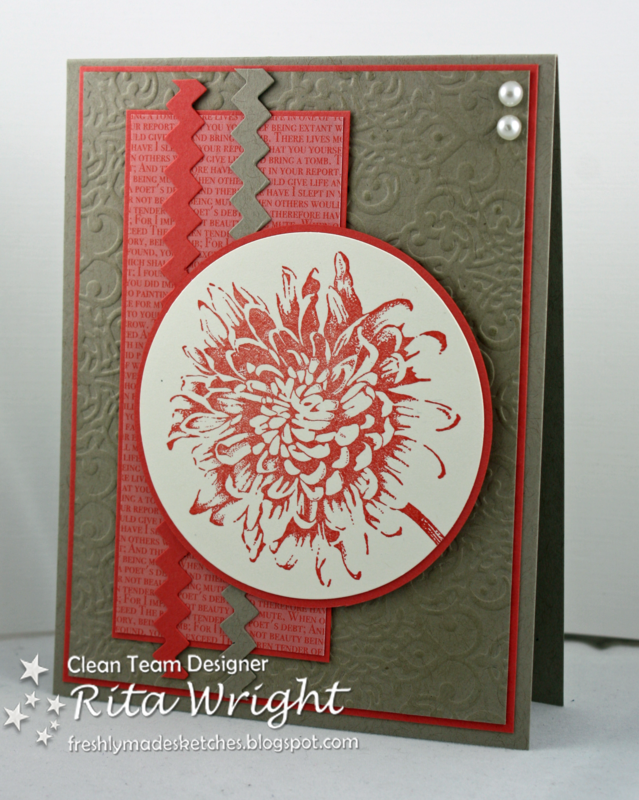 It's time for stamp club again this week! 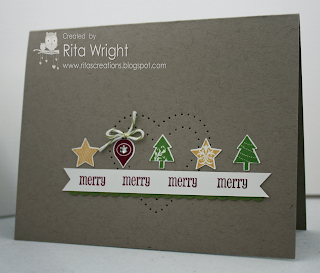 I went to extremes this time, a simple card (above) and a fancier card which I'll post below. This simple card features Gently Falling, one of my favorite sets! 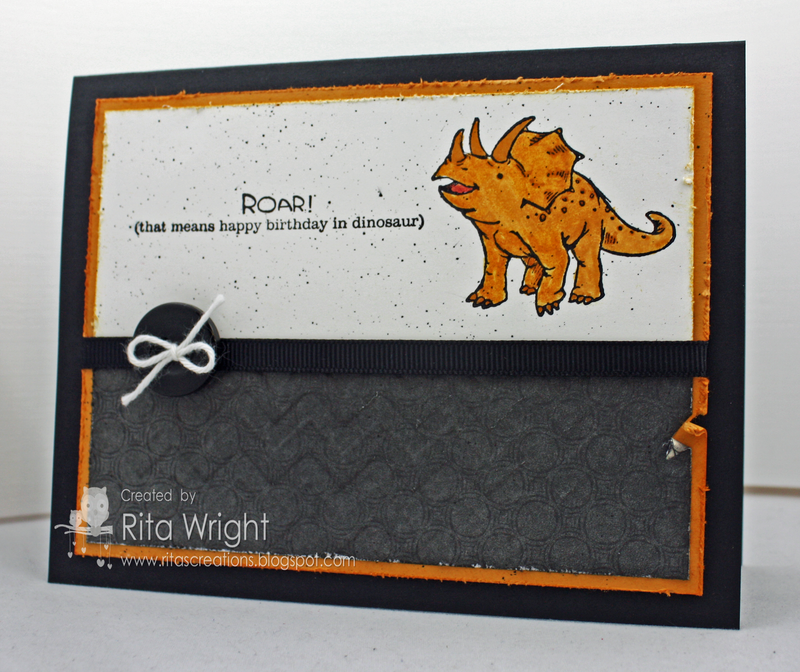 I used the layout and idea from Maile's card and Tami's technique to get this one to come together. Isn't it gorgeous? 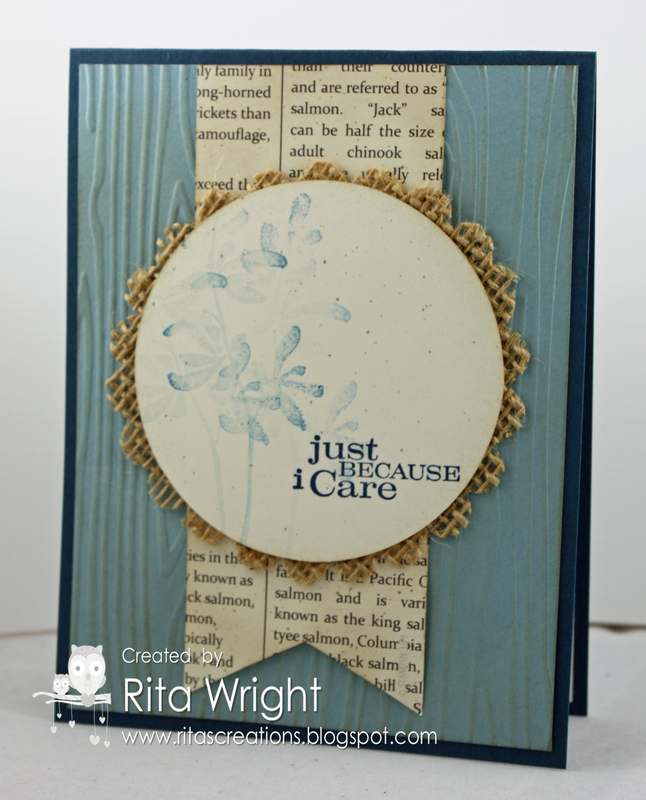 I just love this paper and I LOVE Midnight Muse! It's such an awesome color! Edited to add, the paper here is the Natural Composition paper. I had a few emails about it but no way to contact the people asking. 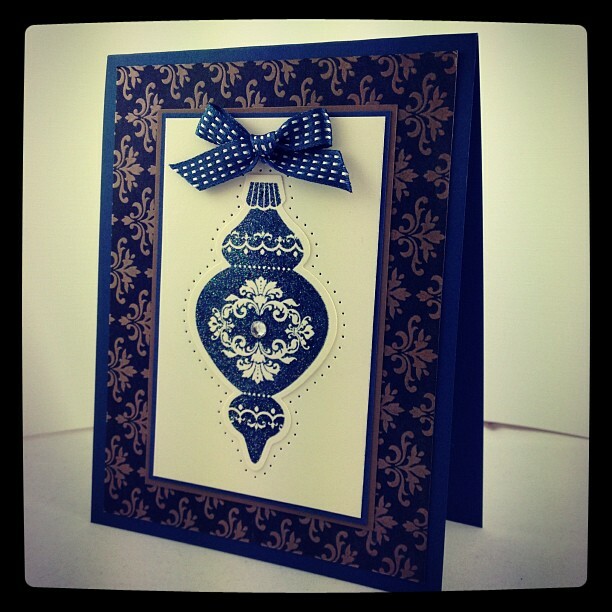 If you have a question about any of my cards, please email me. Just leaving a comment on my blog doesn't always allow me to email you back; it just depends on how you have your profile set up whether your email address is included or not. I am not the best at answering, I'll go ahead and tell you that. Laila is requiring more and more attention so my time is limited for stamping, blogging, and email. I can only imagine how it will be once she's mobile! Yikes! Laila decided she must hold the book herself while we were reading. Umm...yeah. I guess she's having vision troubles and had to get it closer to read? So silly. I'm going to try to add a video below but I don't know if it will work or not. It's pretty funny! Woo Hoo! 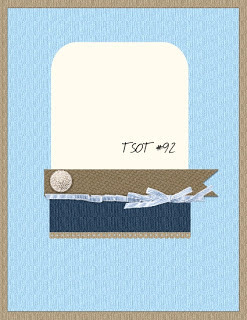 This is card #35 and the LAST one of the Hope You Can Cling To challenges. I finished ALL of them!!! I'm so proud of myself. I struggle to accomplish my goals lately, so completing this one that's for sure a great cause makes me so happy! 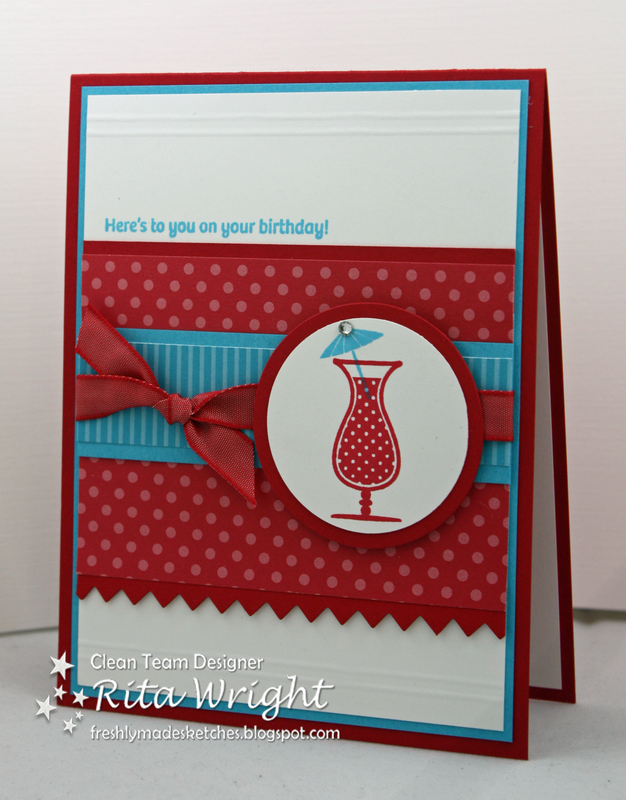 This card is for Teresa's ta ta toe challenge. My squares were pink, patterned paper, and buttons. I used Donna's card for inspiration as I thought it was such a perfect cheerful card. Finally, this is for Lydia's challenge: For this challenge use any outdoorsy inspiration. I am not a big outdoors person, but I love fall. 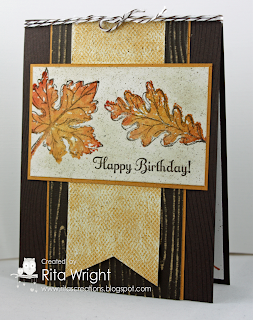 I created some lovely leaves using my favorite colors from this season. She's not convinced that this toy is fun. :) As a side note, if anyone knows where the switch is to turn babies back to daylight savings time, I would love to know. We were up a wee bit early today. 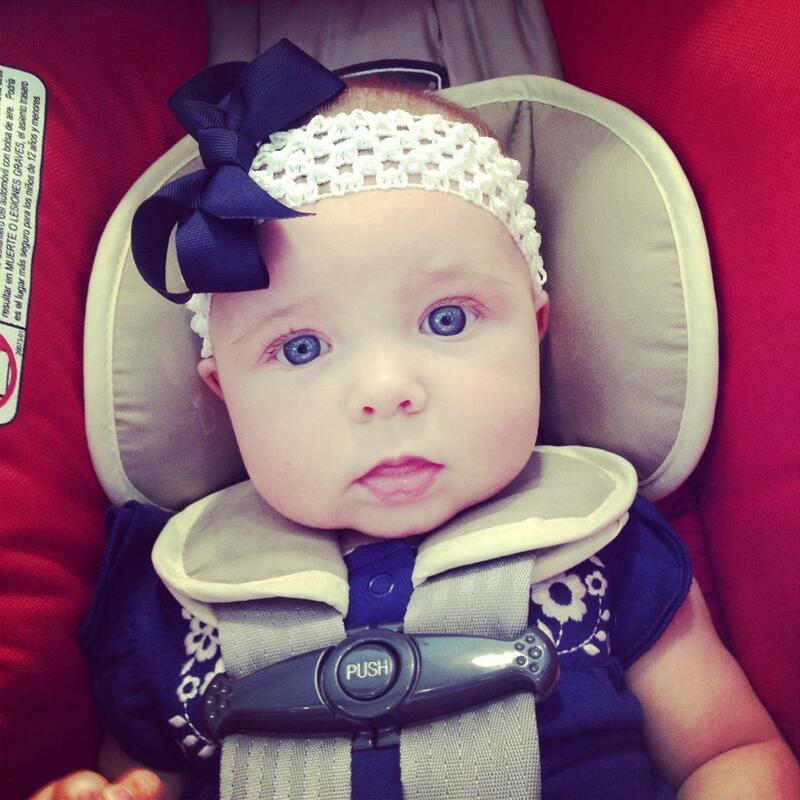 I think that change along with her four month shots tomorrow might make for a long week. 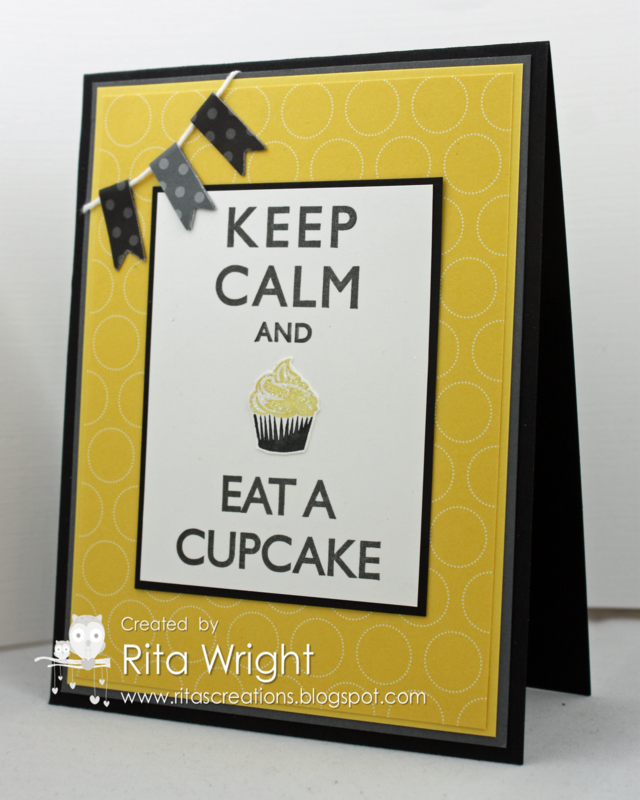 I have two events this week and haven't started prepping yet, so I am going to be one stressed out momma!